Are you looking for an Affiliate Marketing Training Program? Well, I’ve got you covered in this post. Most people jump into Affiliate Marketing without proper training and when they don’t make money after a few months, it begins to appear like it’s not working. This free professional Affiliate Marketing training will get you established and comfortable online. Affiliate marketing is a simple activity on the Internet where you promote and sell others products and be paid a commission. It’s by far the highest way to make money online even without a product or website of your own. Affiliate marketing is capable of turning your life completely from a poor no-body to full blown moneybag. All you have to do is learn the system and do it rightly. I have been doing affiliate marketing for some years now and making cool money from it. Recently, I came across an exceptionally good training program with 100+ free lessons. The best part is this is free. Affilorama.com gives you free and unlimited access to over 85 video tutorials with PDF lesson notes. What do you get when you sign up to Affilorama’s free training program? Lesson 1: How Does Affiliate Marketing Work? In this lesson you get the no-hype low-down on how affiliate marketing works, 6 great reasons to be an affiliate marketer, how much money you can make and how you can get started today. This lesson shows you how to properly research a market before you sink time (and maybe money) into creating campaigns. This will save you a lot of time, money and heartache in the long run. And it can help you find profitable markets that you wouldn’t have known about! Pay-per-click (or PPC for short) is one of the major methods affiliates can use to get traffic to their websites but do you know how to go about it and not waste money? Why not take this excellent free training program? As an affiliate, chances are you’ll end up building a website or two. This section covers aspects of site building from purchasing your first domain and uploading your website, all the way through to creating 301 redirects in your htaccess. In this lesson of this affiliate marketing training program, you’ll find a bunch of suggestions for thinking “outside the box” in your affiliate campaigns. If you’ve whacked up a website and peppered it with affiliate links and you’re not sure where to go next… take a look at some of this lesson. Want content for your website (blog), viral e-book or newsletter? This section is all about how to create content, how to get it created for you and how to write headlines that drive your sales through the roof. In this section, you meet some of the biggest names in affiliate marketing! These interviews give you an insight into the minds of some of the most successful people on the internet. This free training program is a set of over 85 videos and pdf to hold your hand, step-by-step till you start making money as an affiliate. With the free training program I mentioned above, you are on for a good walk into affiliate marketing. However, you need premium tools and more resources. Now, rather than having to pay high at different places to get domain names, web hosting, keyword research tools, link tracking tools, PPC tool, etc, all of these things have been bundle in one place for the price of one. That’s exceptionally more profitable. So what’s in affilorama premium? It combines vital marketing software suites into one. It saves you from having to purchase these individually, and it saves your time by having it in one place. So what do you get? A ‘blog bootcamp’ video series. In 4 over-the-shoulder videos, it shows Mark Ling creating a video from scratch – and then shows the results he achieved. Access to hundreds of PLR articles in numerous niches, updated monthly. Website hosting for up to 15 websites for a year. Are you making enough money with Affiliate marketing? Have you checked out these free lessons? Thanks for reading and taking an action. Thanks for sharing..! That is an amazing opportunity to join and test the online marketing resources. That is really to spent just only one dollar and get start learning, also we could follow what the successful online marketing doing for their successful career. this program is simply the must follow to achieve success online. See you buddy! As I said, I read a lot of happy reviews, that’s was when I wanted to promote this product to earn a commission like you do now. You know, and I’m sure you do know, a little bit of research about any product or services worth the time to make sure conversion rate is satisfactory. I have been searching it from very long as I don’t know where and how to start AM. I got many suggestions from pro bloggers to begin AM but my laziness and starting problem are not letting me to get in to it. Nirmala recently posted…How To Use Google Plus To Increase Brand Awareness Of The Business? These are excellent free training materials Nirmala and I’m sure you’ll love them. Any feedback? Who doesn’t appreciate free stuff especially power materials like these geared to make one more bucks? Affiliate marketing is a great idea for making real cool money online…the only method I know that beats it hands down is selling your own products (especially on marketplaces like Amazon and eBay). Believe me, those alerts can literally make one’s day! Do have a very great day…and thanks for the info! Blogging is the best way of making money online. I own 4 blogs and making money from it. Google AdSense is the giant of ads providers. You can make hundreds of dollars in a day from blogging. The premium version seems to be effective, so I think it worth investing in it. The configuration seems to be user friendly, so anyone can make it. That’s what I like paying for, when something works easily. There are lots of possibilities in the CommentLuv Premium. Sir, I Joined Affilorama a week ago and found that this is one of the best way to know about Affiliate Marketing. 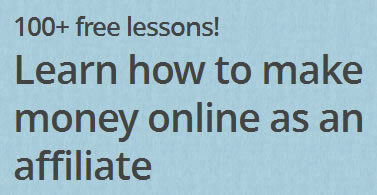 Just after Sign up, when I checked out the Introduction to Affiliate Marketing lesson I become impressed. Each and every point about Affiliate Marketing is mentioned very clearly which is very helpful for us. When i visited the forum of affilorama then i got some more amazing information and discussion. Most important thing the Founder of Affilorama (Mark Ling) sends regular updates via email that helps us to stay updated with new features of affilorama. All credit goes to you for sharing this great and detailed article with us. I started on the free lessons and unlocked the Affiloblueprint… the “make $50 a week” site blueprint was too juicy for me to skip it… so far so good. Welcome to my blog and thanks for sharing your experience. How is it with Affiliate Marketing in general? The valuable experience. Thanks for sharing your experience. Thanks for this useful guidance on starting with affiliates marketing. I have just signed-up with clickbank and looking for how to start with it. A free affiliate training program! It sounds very good to me, I hope I can get this fantastic offer. Affiliate marketing is a simple activity on the Internet where you promote and sell others products and be paid a commission. It’s by far the highest way to make money online even without a product or website of your own. Thanks for sharing your useful information article. Affilorama is really great for beginners. I have learned everything about Affiliate Marketing from Affilorama. Great advice for those looking to make money with their blogs. I think the only thing I can add to that would be to make sure you keep up with your blog and post consistently. Nice and descriptive article for the beginners to understand about what it is. I genuinely found affilorama the best program on affiliate marketing. Even clickbank suggest this program to their new members. All and all a very good take. Wow this is some really interesting information.I will give Affilorama a try to see what happens. Thanks again.